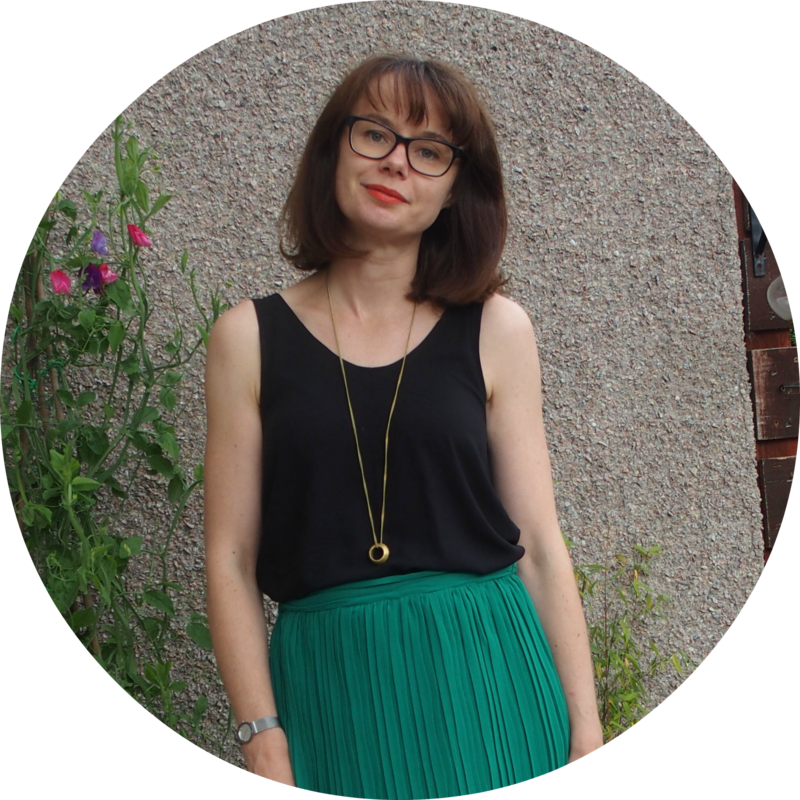 Since it takes me quite a while to complete a garment, I thought I might boost my blog slightly with some "here's one I prepared earlier" posts, to hold your interest and keep my hand in! 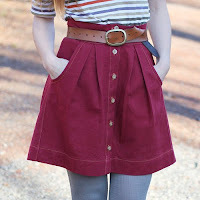 I am starting with a Megan Nielsen Kelly skirt that I made at the end of the summer last year. If I'd had the foresight to wear a me-made top with it at the weekend, when I took the photos, you could have got 2 for the price of 1. But I didn't. So you can't. Obviously zoomed in a bit too far on this one! The Kelly is made from a red denim with slight stretch which I picked up in John Lewis* during the summer. The stretch is not necessary for the pattern, I just liked the colour and fabric, and had never sewn with denim previously. I was also really inspired by one of the sample versions on Megan's website and this fabric felt kind of in the same vein. I LOVE this pattern. It was so simple to sew up. The pattern itself is basically 2 rectangles plus a waistband and the pocket pieces, but sometimes simple is best. I cut a size XS, which was a tad optimistic, as when I tried the skirt on for the first time (after attaching the waistband, before the buttonholes) I realised it was quite neat. So, I just cut another waistband in a size S, and unpicked the side seams and resewed using slightly smaller seam allowance, and this worked a treat! I used a contrast quilting cotton, which I bought for the purpose, for the pocket lining, and used the same fabric to bias bind the pockets, which I rather like. I probably should have also used the bias binding on the side seams, but my bias binding maker wasn't playing, so I gave up after the pockets. Should really have ironed this before taking photos! The buttons, are kind of like distressed wood and maintain the casual look I was going for. On the subject of buttons, why are they so expensive? I saw loads that I liked, but some were over £3 each and I needed 7! I just cannot justify over £20 on buttons! That was more than the fabric cost! I really, really love these buttons. The simplicity of the pattern. So straightforward! Plus it's printed on proper paper, which makes it really durable! I could fit the pattern pieces into 1 metre of fabric, by cutting the waistband on the fold. This means a version in a more expensive fabric is viable in future! Nothing (except the size being wrong due to my own vanity). Contrast pocket lining (hardly rocket science) and bias bound pockets (ditto). Maybe line it. The denim sticks to my tights, which is a pet hate, and I haven't yet found a slip that's the right length. This is such a great basic pattern that has so many possibilities. All I need is more time to make them! * Please don't think that I only ever buy fabric from John Lewis, but it's just so handy being in the city centre and in the past 6 months, their selection (although still very expensive) has improved by 200%, which is just too too tempting - the lady who cuts the fabric said they have a new buyer, and it shows! I've been looking at the Kelly and Colette's Beignet but I'm nervous about all those buttons! Your version is really cute and I really like the contrast binding. I've never tried making my own. Was it difficult and did you use a tutorial? Hi Shar. The skirt itself was dead easy. It really is just a couple of rectangles with some pleats. I was nervous of buttonholes before I tried them, but my sewing machine has a buttonhole stitch and foot, which means it pretty much just does the job for you. Does yours have this? I was lucky enough to get a free lesson when I bought my machine last year, so the woman in the shop showed me what to do. That, plus my instruction booklet, was enough. My main tip would be to practice loads on some scraps before you commit to your garment. I made sure I practised on the same number of layers of main fabric plus interlining, so that it was a "true to life" practice, if you know what I mean. I'd be happy to attempt some type of tutorial if you like (get me, a month old blog and offering tutorials already)? I'm not sure that all machines are the same, but I guess they must work along the same lines. My machine does have both a buttonhole stitch and foot, but I'm embarrassed to say that I haven't used them since the free class that came with my sewing machine a year ago! My machine spent a lot of the last year in the basement since I didn't have a dedicated space, but this past fall my wonderful husband suggested we replace the bed in our spare room with a pull out couch and he would build me a sewing table. Ever since I've been sewing every chance I get but kept avoiding buttons. I guess I should take the plunge. Good tip on making sure to use the same fabric type and number of layers when practicing. I realized too that you did note a Colette link for bias binding in a previous post. I love Colette's tutorials and used their video tutorial to add the invisible zip to my Charlotte skirt. I think you should do tutorials on your blog. I think practical experience goes a long way in being able to explain things (especially to newer sewers like me). Thanks! Don't feel embarrassed. We probably all have stuff we're scared to do! A challenge, a sewalong and a swap! Sew Grateful - Thank You!